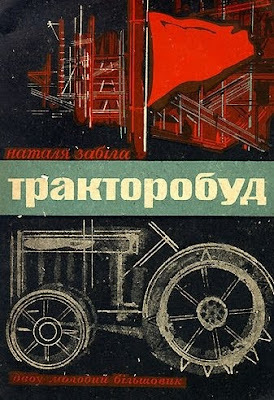 This was a booklet produced in the Soviet Union sometime in the 1930s on the country's tractors. Although he knew nothing about farming, like the party hacks sent into the countryside to manage collective farms, Stalin was a fan of tractors and propaganda films of the time often featured them and at least one showed him driving one. In the early 1930s the Soviet Union had set ambitious plans to mechanise farming with three major tractor factories, a combine harvestor factory and a large machinery factory completed between 1930 and 1933. But, as with all their other industrial plans, the ambitious output targets were not reached.